Whether in opera, theatre, literature, or any other artistic genre, one of the finest of the proverbial fine lines is that separating true comedy from the merely inane. 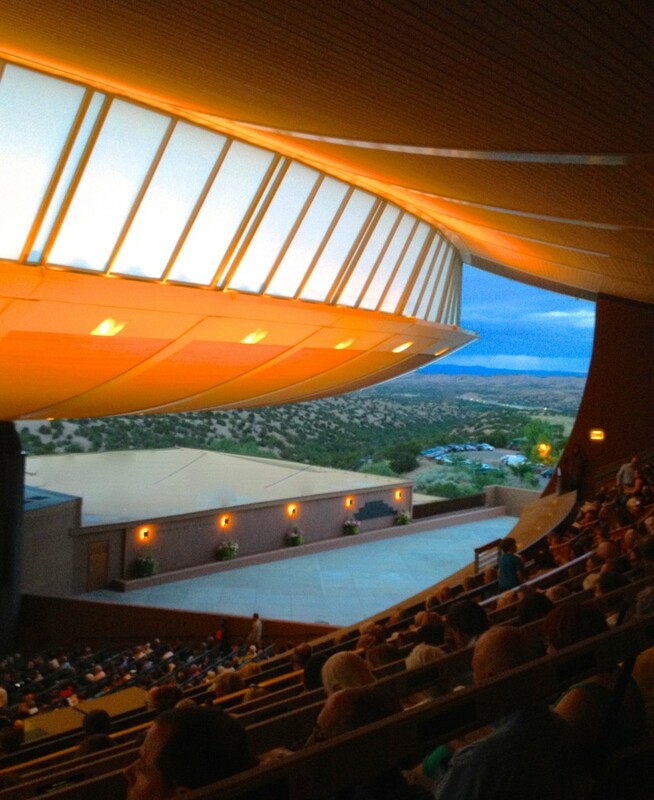 Few evenings in the opera house are more excruciating than those on which audiences are exposed to scores or productions—or scores and productions—that aim at comedy but consistently miss the mark. On the other hand, those few occasions when composers’, librettists’, and performers’ efforts at comedy find their targets can produce unforgettable experiences. Directed with flair and a raucous sense of joy by Stephanie Havey, North Carolina Opera’s production of Gioachino Rossini’s Il barbiere di Siviglia—a staging that originated at the Glimmerglass Festival and will be revived by Opera San Antonio in 2017—came tantalizingly close to stepping wholly over the line into genuine comedy that could be enjoyed without reservations; so close, in fact, that the performance’s few defects, none of which upset the equilibrium of the performance, quickly faded into insignificance. Perfection is admirable, but how often is it enjoyable on a level that prompts patrons to leave a theatre after a show, saying to one another, ‘That was really fun’? 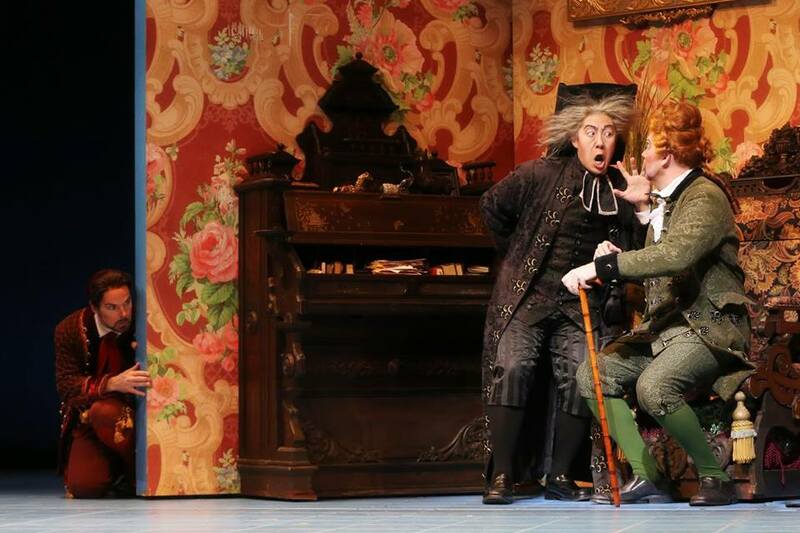 When Il barbiere di Siviglia, ossia L’inutile precauzione, a setting of Cesare Sterbini’s adaptation of Pierre-Augustin Caron de Beaumarchais’s seminal 1775 play Le barbier de Séville, premièred at Rome’s Teatro Argentina on 20 February 1816, Rossini was a week away from his twenty-fourth birthday. Several of his most noteworthy and lucrative successes were already behind him, and his final opera, Guillaume Tell, lay only a dozen years in future. 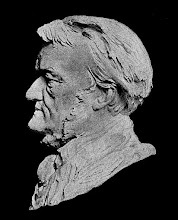 Despite the quality of many of his scores and the recent interest in them beyond the Rossini shrines of Pesaro and Bad Wildbad, Barbiere remains the opera upon the shoulders of which its composer’s fame is hoisted, and, no matter how many times an observer has seen the opera performed, a wholly satisfactory Barbiere justifies the score’s prominence in both the Rossini canon and the international repertory at large. With wonderfully colorful and occasionally slightly confusing costumes by Howard Tsvi Kaplan, originally designed for Sarasota Opera [Lindoro looked as though he strolled out of the pages of Pride and Prejudice, but the Conte was the epitome of Eighteenth-Century chic: were poor students more ‘fashion forward’ than aristocrats in Rossini’s Siviglia? 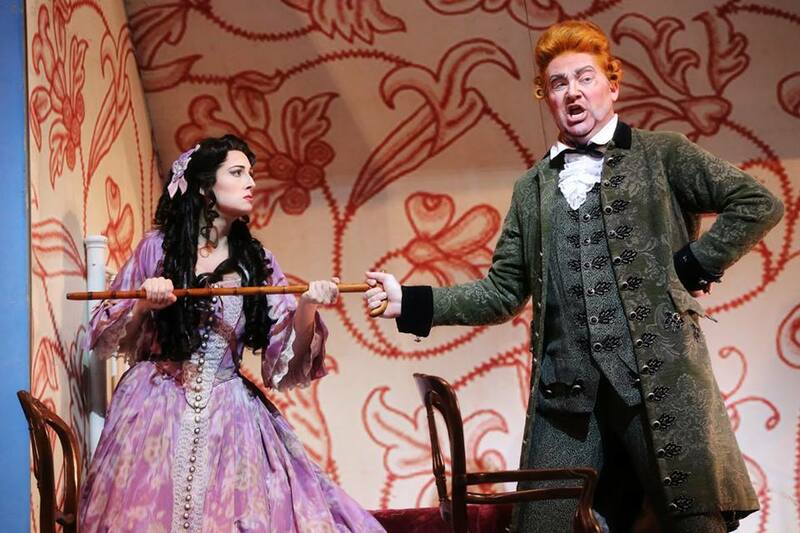 ], Sondra Nottingham’s typically effective wigs and makeup, and Jeff Harris’s intuitive lighting designs, North Carolina Opera’s Barbiere looked as lively as it sounded. The production’s mobile sets by the widely-admired John Conklin were essentially a character in the comedy but one whose part was not over-done, and strategically placing Rossini’s portrait above the rickety piano—no Bösendorfers or Broadwoods, chez Bartolo—for the Lesson Scene was a crafty touch. Best of all were the bicycles: Figaro ringing his bike’s bell in time to the orchestral introduction to his celebrated cavatina was fantastic. One shudders to think of the piles of money that are spent on far more elaborate productions that are far less successful than this picturesque but abidingly uncluttered Barbiere at conjuring the worlds depicted in composers’ scores. After witnessing his masterful conducting of Mozart, Timothy Myer’s confident, debonair handling of Rossini’s music was not unexpected, but it is always astonishing and gratifying to observe the manner in which this insightful musician wields his baton like a spotlight, focusing performers’ and listeners’ attention on details large and small that facilitate full appreciation of composers’ and librettists’ creations. In this performance of Il barbiere di Siviglia, Myers lit firecrackers in the orchestra that detonated hilariously, the playing of the North Carolina Opera Orchestra first-rate from the opening bars of the famous Overture—borrowed, of course, from Aureliano in Palmira and Elisabetta, regina d’Inghilterra, both serious operas. Guided by Myers, whose ear for instrumental timbres rivals the late Sinopoli’s, the woodwinds had a particularly fine evening, their phrasing and intonation setting a high standard for their colleagues in the pit and on the stage. Even in the Temporale, its opening wind passages prefiguring the similar scene in Act Three of Verdi’s Rigoletto, the percussionists’ playing was restrained, allowing the palette of colors in the music to emerge with atypical clarity. In Myers’s handling of the score, complemented by Laurie Rogers’s inventive harpsichord continuo and red-blooded but always shapely singing by the gentlemen of Dr. Scott MacLeod’s impeccably-trained North Carolina Opera Chorus, it was unusually easy to imagine the central characters in Barbiere morphing into their older, more careworn selves in Mozart’s Le nozze di Figaro. The enthusiastic ovations that Myers receives from Raleigh audiences are merited, not just for individual performances but, perhaps more significantly, for the continuing elevation of standards that his leadership has initiated, as well. With exuberant but logical tempi and management of ensembles that went awry commendably infrequently, Myers guided a performance of tremendous humor possible only through the work of a very serious musician. 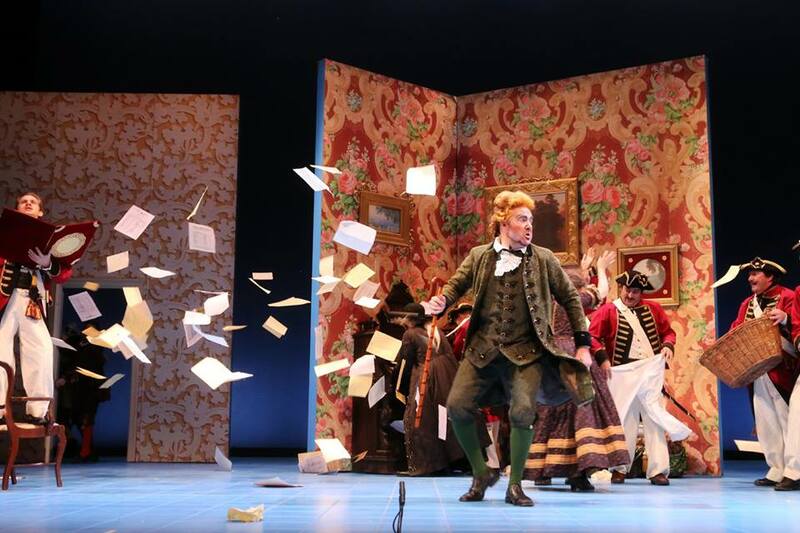 A reliable aspect of recent North Carolina Opera productions has been excellent casting of secondary rôles, and this Barbiere di Siviglia furthered that trend in glorious fashion. Though not uttering a single word, Joseph Stephens’s Ambrogio enriched every scene in which he appeared, whether partially hiding under his laundry basket, suddenly taking a liking to swordplay, or rejoicing in the final scene at the return of a purloined equine figurine. The foremost regret inspired by tenor Wade Henderson’s singing as Melot in North Carolina Opera’s November 2014 concert performance of Act Two of Wagner’s Tristan und Isolde was that he had so little to sing, and the same complaint must be made about his Ufficiale in Barbiere. Appearing in the Act One finale, Henderson was splendidly commanding as the voice of constabulary authority, the voice ringing like the clink of handcuffs. As the bandmaster-for-hire Fiorello, baritone Charles Hyland sang ‘Piano, pianissimo senza parlar’ at the opera’s start with handsome tone and acted his part to perfection. 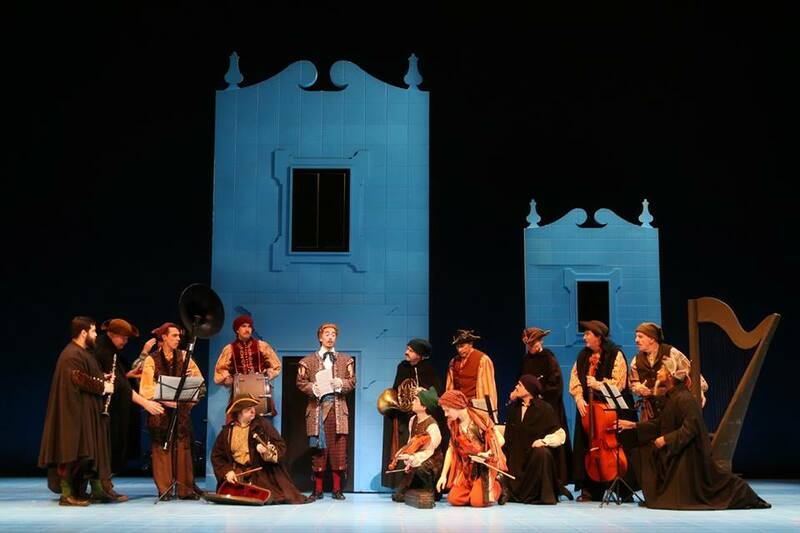 [The onstage musicians’ eager petitioning of the Conte for immediate and generous payment brought to mind the Duke of Plaza Toro’s assessment in the Gilbert and Sullivan gem The Gondoliers: ‘That’s so like a band!’] A member of the University of Mount Olive music faculty, mezzo-soprano Marie Ashley schooled the audience in the art of operatic comedic timing with her live-wire performance as Berta, Bartolo’s long-suffering housemaid. Ashley’s voice soared in the Act One finale, encountering no trouble with doubling Rosina’s line as it climbed above the stave, and she was the rare Berta whose Act Two arietta ‘Il vecchiotto cerca moglie’ was a delight. Rossini clearly intended that Berta should be entrusted to a singer no less capable than the lady cast as Rosina, and North Carolina Opera heeded this implicit instruction, Ashley proving as wonderful in the second finale as in the first. The character’s predicament notwithstanding, there is no reason why Berta must sound like a superannuated comprimaria: rather, she ought to sound as Ashley sang her in Raleigh. 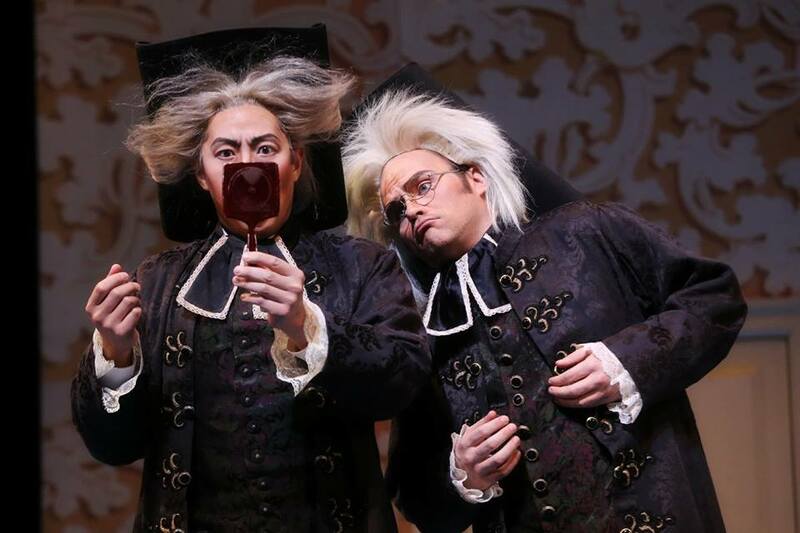 The casting of Adam Lau, the fantastic Leporello in North Carolina Opera’s 2015 production of Mozart’s Don Giovanni, as Rossini’s Don Basilio was an instance of an ideal intersection of singer and rôle. A delectably conspiratorial—and kleptomaniacal!—presence in Act One, Lau delivered the aria ‘La calunnia è un venticello’ with amplitude that packed the punch of a ‘colpo di cannone,’ only the final bars slightly compromised by forcing. In the Act One finale, Lau voiced Basilio’s lines with sonorous aplomb. His collapse when ‘wounded’ by a flying pillow in the cleverly-staged ‘battle’ between rival factions was worthy of vintage Rick Flair. As the centerpiece of the Act Two Quintetto, Lau amusingly sang and acted Basilio’s befuddlement, willing both to suffer his sudden malady’s ill effects and to recover from them with equal rapidity depending upon which circumstance yielded the greater windfall. Vocally, Lau was as solid a Basilio as can be heard in any production of Barbiere today, a rival to the exalted legacies of Ezio Pinza and Cesare Siepi, and he was fabulously buffo without being a buffoon. Bass-baritone Tyler Simpson proved to be one of the most elusive commodities in opera: a Bartolo who actually sang his music. Looking quite smart and engagingly smug in his emerald-green suit and polished-copper periwig, Simpson’s Bartolo stalked the stage with the nervous energy of an out-of-practice predator. Briefly sparring with Rosina before her window in Act One, his was paternal sternness not to be ignored, and bass-baritone and bass were particularly well-matched in Bartolo’s scene with Don Basilio, Simpson’s querulous ‘No’ when rejecting Basilio’s suggestion of eliminating the Conte as a rival for Rosina via well-timed slander enunciated with deadpan disposition. Simpson’s performance of the aria ‘A un dottor della mia sorte’ was marvelous (and, again, truly sung), the patter dispatched with brilliance and the full range of the music covered with ease. Simpson took command of the Act One finale with sly humor, throwing caution to the wind and thrillingly unleashing the full power of his voice—and brandishing a walking stick with the braggadocio of Douglas Fairbanks. In his scene at the beginning of Act Two, this Bartolo made something peculiarly touching of his statement of ‘Ma vedi il mio destino!’ Like the most insightful interpreters of Donizetti’s Don Pasquale, Simpson allowed Bartolo’s heart to penetrate the brusqueness for a moment, giving his interpretation even greater immediacy. In the duet with the Conte, now disguised as Don Basilio’s supposed protégé Don Alonso, the bass-baritone’s vocalism radiated annoyance and suspicion. Unsurprisingly, his account of the arietta ‘Quando mi sei vicina amabile Rosina’ in response to Rosina’s singing lesson was music, not bluster. In the grand Quintetto and the opera’s final scene, Simpson gradually transformed Bartolo’s foolishness into graciousness: his gesture of kissing Rosina’s hand after realizing that he was outwitted was both conciliatory and affectionate. Vocally and histrionically, Simpson was a Bartolo in the now-endangered tradition of Sesto Bruscantini. Above all, his performance was a rousing confirmation of the oft-ignored wisdom of good singing being just as important in comedy as in tragedy. The rôle of the amorous young Conte d’Almaviva was first sung by Spanish tenor Manuel García, a legendary figure in the history of opera as both a singer and a pedagogue, and has subsequently been interpreted by a wide array of tenors, some of whom had as little business singing Rossini as García would have had singing Verdi’s—rather than Rossini’s—Otello. To the class of natural-born modern Conti d’Almaviva like Cesare Valletti, Ugo Benelli, Alfredo Kraus, Luigi Alva, Bruce Ford, and Juan Diego Flórez belongs Andrew Owens, whose singing in Raleigh combined technical brilliance with tonal beauty that served as a reminder that the clever aristocrat was also an early rôle for Giuseppe di Stefano. All being fair in love and war but emphatically not in opera, it is sometimes difficult to ascertain during performances of Il barbiere di Siviglia why the cultivated Rosina would prefer her earnest but supposedly penniless swain Lindoro—our quick-thinking Conte in disguise, of course—to the canny Figaro. Looking as though he just stepped off of a Hollywood studio lot, Owens scored a triumph for the ranks of less-glamorous Conti by leaving no doubt of why Rosina’s well-guarded heart palpitated for him and him alone. 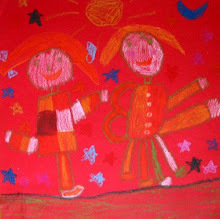 What counted most was that the sounds that he made were as attractive as the smile that he wielded like a starburst. Spreading his irrepressible elation over the stage like a sunrise, this Conte serenaded his beloved with plangent tones. Owens phrased the Act One cavatina ‘Ecco ridente in cielo spunta la bella aurora’ with effortless bel canto, rising to the tops As and B with aptly noble poise. He decorated his performance of the lovely serenade ‘Se il mio nome saper voi bramate, dal mio labbro il mio nome ascoltate’ with dashingly original ornaments. Rosina was surely not the only lady in the theatre inclined to open her window to take in such golden sounds. Owens made easy going of the punishing triplets in the passaggio in the duet with Figaro, and his singing of ‘Ehi di casa...buona gente’ as the inebriated soldier in the Act One finale was side-splitting. The Act Two duet with Bartolo drew from this natural comedian repetitions of ‘Pace e gioia sia con voi’ that grew steadily more insistent. Accompanying Rosina’s lesson, Owens’s mock-pianism would have caused Victor Borge to blush with admiration and envy. His voice fizzed with excitement in the spirited Terzetto with Rosina and Figaro. With such a capable Conte on hand, it was a pity that time constraints conspired to exclude the aria ‘Cessa di più resistere’ from the performance, but Owens was in every other way a winningly complete Almaviva who emitted many a phrase that brought the inimitable Tito Schipa to mind. Rossini is rarely cited as a master of deeply-considered characterizations, but Rosina is a deceptively difficult rôle, especially for younger singers. Being a Spanish lady with a piquant streak, Rosina too often falls victim to interpretations that make her a sort of coloratura Carmen. Underplay her vivacity, and she is apt to seem a pallid waif unlikely to attract as practiced a tomcat as the Conte: overplay her independence, and she can seem an equally undesirable shrew. 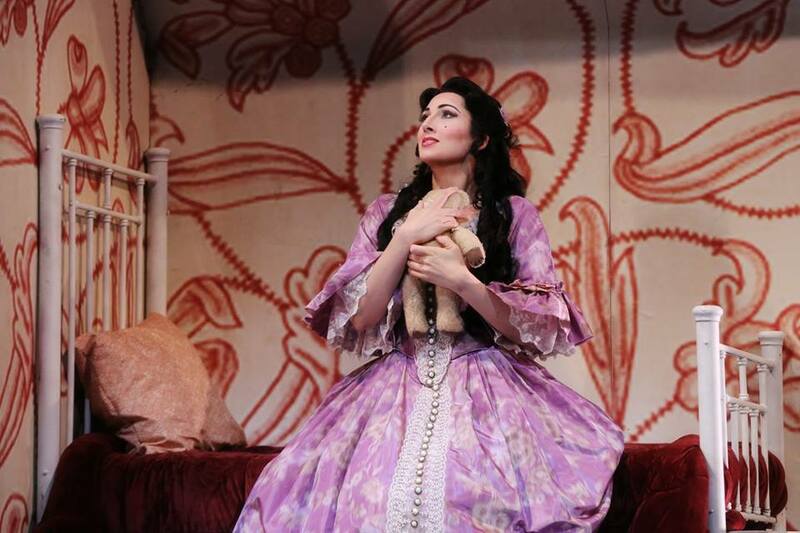 North Carolina Opera’s Barbiere di Siviglia had in mezzo-soprano Cecelia Hall a Rosina of both style and substance, one who created a carefully-balanced, three-dimensional character without sacrificing any of the sheer fun—or the volleys of notes—of the part. Occasionally, she was slightly too subdued for her surroundings, though this admittedly deepened the contrast between this innocent young woman—she intended to bring along her doll, teddy bear, and favorite pillow when fleeing with the Conte, after all—and her boorish guardian. It was a most timid creature who appeared at the window during Lindoro’s serenading in Act One, but sparks flying in the recitatives with Bartolo and the Conte hinted at the fire that burned beneath the cool exterior. The newly-ignited conflagration melted the frost in Hall’s demeanor in the cavatina ‘Una voce poco fa,’ the singer spitting out the words in the Moderato section, ‘Io sono docile, son rispettosa,’ with well-controlled abandon. In the duet with Figaro, ‘Dunque io son...tu non m’inganni,’ her singing combined feminine charm and a wily grasp of sexual politicking. Hall’s awestruck articulation of the Andante ‘Freddo ed immobile come una statua fiato non restagli da respirar’ in the Act One finale was wonderful. In the Lesson Scene in Act Two, Rossini’s intended aria, ‘Contro un cor che accende amore,’ was preferred, and Hall reached its top As effortlessly. The Terzetto with the Conte and Figaro received especially dulcet treatment from the comely young lady, her unaffected pronouncement of ‘Ah! 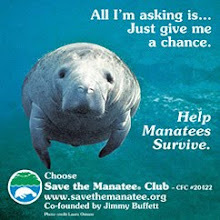 qual colpo inaspettato’ garnering a deserved burst of laughter from the audience. Her joy spilling over the footlights in the opera’s finale, Hall’s Rosina earned her happy ending. Aside from a few inaudible notes at the very bottom of the compass, likely the results of the singer’s judicious way with balancing head and chest registers, Hall’s comfort with both the range and the bravura requirements of Rosina’s music—including a respectable trill—was praiseworthy. Barbiere can function effectively enough with a merely serviceable Rosina, but how exhilarating this Barbiere was with an expert one! With a Rosina and Conte such as North Carolina Opera’s production supplied, it was difficult for a Figaro to dominate the opera, but baritone Troy Cook left no doubt about whose name—or professional identity, at any rate—is on the score’s title page. [The opera having been first performed with the title Almaviva was an act of deference to Giovanni Paisiello, composer of a then-still-fashionable earlier setting of Il barbiere di Siviglia, it should be remembered.] Entering on bicycle like a vision from Il postino, Cook sang Figaro’s Act One cavatina ‘Largo al factotum della città,’ one of opera’s most iconic numbers, with swaggering virility, the high tessitura and tongue-twisting patter manfully conquered. 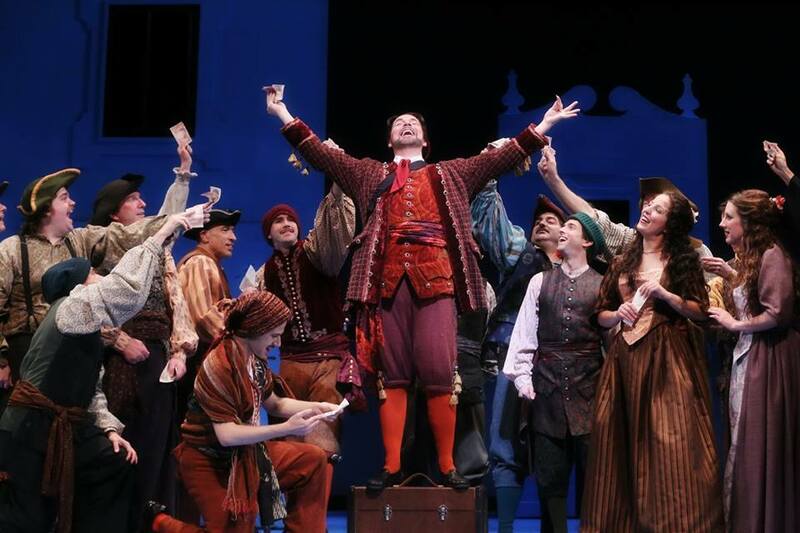 The prowess of this Figaro’s Dulcamara-esque matchmaking was indeed magical: the portrayers of the adorable sevillano couple that he brought together on the stage, Chandler Clarke and clarion-voiced chorister Jacob Kato, are betrothed off the stage, too. Bravissimo, Figaro! Joining with the Conte in their brainstorming duet, the glee in Cook’s voicing of ‘All’idea di quel metallo’ was infectious, and he and Owens exhibited finely-honed synchronicity in the difficult triplets. Similarly impressive was Cook’s reading of Figaro’s part in the duet with Rosina, ‘Dunque io son...tu non m’inganni.’ Unlike many singers, he resorted to no faking or simplification: he had the notes and the skill needed to project them into the auditorium. With his cherry-red top hat and feline suavity, Cook’s Figaro danced through the Act One finale like a benevolent Mefistofele. Bounding about the stage with growing anxiety in the Act Two Quintetto and, even more so, the Terzetto with Rosina and the Conte, Cook’s Figaro was clearly unnerved by feeling dominion over his situation slipping from his fingers, but the baritone’s vocalism never faltered. Even in the opera’s final scene, Cook’s voice shone among his colleagues’ high-wattage singing. Hearing the assurance with which he sauntered through Figaro’s roulades, it was remarkable to recall that Cook was also a wholly satisfying Marcello in North Carolina Opera’s 2014 production of Puccini’s La bohème. Who since the retirement of Robert Merrill has beguiled the public with top-quality performances of such very different rôles? What makes Rossini’s Il barbiere di Siviglia genuinely funny is the nucleus of humanity that exerts an insurmountable force on the buzzing particles of the music, keeping even the orbits of the frothiest moments of comedy on course. What too many performers fail to realize or fully respect is that Rossini suffused his score with music that pulses with laughter of its own accord: Barbiere does not need singers’, conductors’, or directors’ assistance to be funny. No, what Barbiere needs is the integrity of a team of artists who approach the score not as a comic opera requiring special tinkering but simply as a musical work of art that deserves unbiased, unblemished interpretation and integrity, and this is what North Carolina Opera’s performance bestowed upon this still-precious gem of an opera.